Chinese President Xi Jinping met with Chairman of the Boao Forum for Asia Ban Ki-moon on Tuesday. 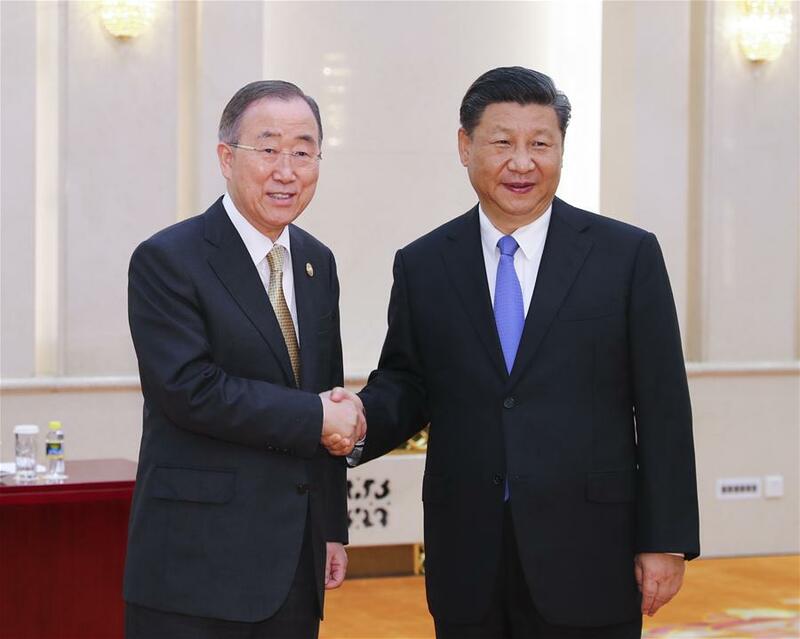 Chinese President Xi Jinping met with Chairman of the Boao Forum for Asia (BFA) Ban Ki-moon on Tuesday, hoping that the forum would provide new methods for solving development issues and improving economic governance. As the host country, China will support the work of the Board of Directors of the BFA, and back the forum to continue increasing its influence, Xi said. "The BFA, established at the beginning of this century, reflects the aspiration of Asian nations to pursue strength through unity, jointly meet challenges and increase the influence of Asia," Xi said. "The mission and purpose of the forum is to promote economic integration in Asia, boost exchanges and cooperation between regional countries and the world, to achieve mutual benefits and win-win results," he said. The establishment and development of the BFA coincided with China's reform and opening-up process, Xi said. The president said he hoped that the forum would advance with the times, focus on Asia and emerging market economies, and pay attention to major development issues in the world. He said he expected that the forum could provide new ideas, new thinkings and new methods for solving development issues, improving economic governance and realizing sustainable development. The BFA should play an active role in promoting the common development and prosperity of China and the world, Xi said. "As unstable and uncertain factors are increasing and new problems and challenges are emerging one after another, Asian countries and the international community need to make right choices between opening-up and isolation, innovation and conservatism, win-win results and zero-sum games," he said. "As I have stated at the BFA annual conference this year, economic globalization is an irreversible trend and the future and destiny of countries in the world have never been as closely linked as they are today," Xi said. "Facing the problems caused by economic globalization, conformism will not be a solution while the only way out is multilateral coordination," he said. Xi reiterated that the door of China's opening-up will not be closed but will only become wider and wider. "We will adapt to openness and score development in an open environment," he said. "China will firmly support multilateralism, safeguard the multilateral trading system and strive to build an open world economy," he said, adding that "China is committed to promoting economic globalization towards a direction that is more open, inclusive, and balanced so that its benefits are shared by all." Noting his announcement of a new round of initiatives to expand opening-up at the BFA annual conference, Xi said those initiatives would be implemented as soon as possible to bring greater development opportunities to Asia and the world. For his part, Ban thanked the Chinese government for its support for the BFA. He said that under the current situation, the forum needed to send out clear messages supporting globalization and free trade. Ban proposed to promote Asia's openness and innovation with the help of the Belt and Road Initiative to achieve better development. In the long run, the forum should go beyond Asia and become an important platform for promoting the harmonious coexistence of the people of the world, Ban said. Yang Jiechi and Wang Yi were present during the meeting.